Univisión Deportes Network (UDN) is the dedicated sports channel owned by the largest Spanish-spoken network in the United States: Univisión. This channel is available in over 40 million households, with its offices established in Miami. 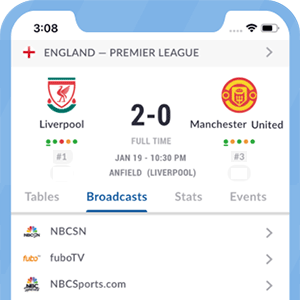 This channel offers HD and SD feeds in several of the top cable and satellite TV services in the U.S. and Puerto Rico, aside from its presence in OTT services such as fuboTV and Sling TV. Univisión Deportes Network's programming is dedicated mostly to broadcast soccer games that might attract the interest of the Spanish-speaking community living in the United States, which may include Liga MX and Copa MX games, along with friendly games featuring the Mexican National Team. This channel has recently added to its content shows and live games from the best football leagues in Europe, both domestic and continental. UEFA-sanctioned tournaments may also be included in Univisión Deportes Network's programming. Univision Deportes programming is also available on fuboTV and SlingTV. *Got itLive Soccer TV does not provide Univision Deportes USA live streaming. The information provided on this page is simply Univision Deportes USA soccer TV schedule.